Almost 100 percent of the state’s installed capacity comes from hydropower. This is less than 15 percent of the estimated 20,000 MW hydropower potential of the state and therefore there is huge scope for harnessing the remaining 85 percent of the hydropower potential. The state’s energy demand has increased over the last five years at an annual rate of about 5-6 percent. Every year it faces a power deficit in the range of 20-25 percent which is much higher than the national average of 3 percent. The primary reason why the state has been unable to use its water resources for bridging its energy deficit is lack of finances. Increase in joint ventures and public-private partnerships can give the required momentum for streaming in the benefits of hydropower generation in the state. Not only will this directly improve the state’s power deficit, it will also have wider repercussions on the socio-economic development of this region. Any water infrastructure development on the Indus river in the state is guided by the Indus Water Treaty (IWT) signed between India and Pakistan in 1960 with the World Bank as the guarantor. The treaty reserves the western rivers (Jhelum, Chenab, and Indus) for Pakistan except for specific use by India for various purposes including irrigation, domestic use, run-of-river hydropower generation and other non-consumptive uses subject to the conditions of design, water storage etc. clearly set out in the treaty. The two countries have off and on got embroiled in differences over the development of water infrastructure on the Indus, particularly hydropower projects. To address such concerns, there is a transparent and vibrant dispute resolution mechanism in the treaty. Both the countries have invoked this mechanism from time to time. For instance, when Pakistan recently objected to the hydropower generation on the western rivers by India, particularly Baghliar and Kishanganga projects, the matter was resolved as per the provisions of the treaty. 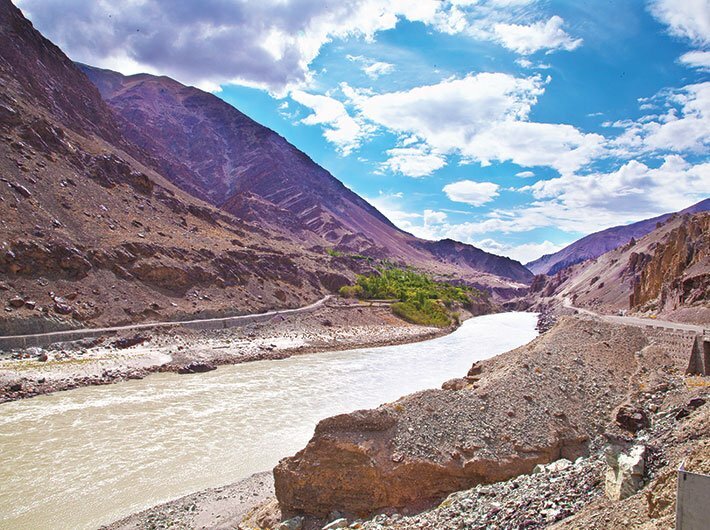 Recently, a few important concerns about sharing of Indus waters between the two countries have also come to the fore and these include climate change impacts, melting of glaciers, groundwater exploitation, water quality, and minimum environmental flows. The two countries share these common concerns but are addressing them on their own within their territorial boundaries. There is a need for a joint mechanism to address them in order to optimise the impact of their mitigation plans. Given the environmental vulnerability and economic constraints of the region, harnessing the entire identified hydro potential by promoting large hydro projects may not be a good strategy. The state has a huge potential for small hydro projects (SHP) in the category of projects up to 25 MW. Small, micro or mini hydro projects are more environment-friendly compared to large and medium hydel projects as they have minimal reservoir requirements and civil construction work. Nowadays, financial institutions (FIs) are also not very eager to finance large and medium hydroelectric projects for a host of reasons, especially due to the long gestation periods and slow return on heavy initial capital investment. As a result, until now only 3,263.46 MW has been exploited in the state. The state has a potential of more than 1,500 MW for small hydro projects (up to 25 MW), but the achievement with respect to harnessing it has been particularly dismal. To promote this source, last year the state came out with a small hydro policy. Its objective is to lay down a framework for the optimum harnessing of hydropower resources of the state and to promote entrepreneurship and private sector investment so that small hydropower can be promoted as an attractive economic enterprise. The Jammu & Kashmir government is actively encouraging small hydropower projects to ensure that the development of this sector serves as an engine for promoting the all-round development of the region. Unlike large hydro projects, SHP projects do not have a long gestation period; so they can be quickly used to meet the power demand. The policy offers several fiscal and financial incentives for investors, like income tax exemption and entry tax or sales tax exemption on machinery required for initial installation or maintenance of these projects. In addition, the department of industrial policy & promotion also unveiled a fresh set of incentives in June to encourage new industrial units and existing industrial units involved in hydel power generation for the period up to 2022. While considering the funding proposals, the FIs, besides other viability factors, satisfy themselves on their concerns about the power purchase agreements. At 30 percent commitment of power purchase under the SHP policy, it will not be difficult for the independent power projects to satisfy the FIs on their loan repayment capacity. In addition, there is also scope for additional profits to be derived from the clean development mechanism. All these efforts will enable investors to loosen their purse strings. In future, one can definitely expect a high tide for hydropower development, particularly small hydro projects, in the state of Jammu and Kashmir. Thambi is a Young Professional in the Energy and Climate Change Vertical of NITI Aayog. Ramshoo is the Head of Department of Earth Sciences, University of Kashmir. The views expressed are personal.